Writings/Videos about Video Games, Books, Shows, and all other media! I’ve had enough. Tom Nook has been given a bad rep by the gaming community, and it isn’t deserved. I will list key arguments and refute them to the best of my ability. My big balled boy needs some love. When you first move into town in Animal Crossing, you are given a choice of where you wish to place your house. Tom Nook walks with you around town as you inspect which place would be best for you. You then erect a house, and Tom Nook charges you a mortgage for it. In the very first Animal Crossing, Tom Nook even questions why you brought no money moving into a town that you knew prior you were going to. Your character had to have known that he needed money to live there, so why didn’t you bring any? You bring like, what, 1000 bells into this town? That’s less than what most bugs sell for in this game. It’s questionable at best. Well, in your time of welfare, Tom Nook OFFERS you a place immediately, as long as you do some mundane chores for him. He gives you a home, and a place to sleep in when none of the other villagers would likely be willing to help you. They would see this unemployed bum move in, notice he’s a different species than him, and probably ostracize him for the rest of his stay in town. Tom Nook does his best to accommodate you and make you feel like you belong in this tiny village full of weeds and people who think Sharks for Shirts is a fair trade. #2 I’m Always in Debt! This cannot be argued. This is the truth. Tom Nook, puts you into debt, and in every other game than New Leaf, he forces you to upgrade your house, putting you further and further into debt. However, this stems from the claim in my previous point: You moved into a town with NO MONEY, NO RELATIVES, absolutely nothing, and expected things to be perfect? Why didn’t you read the fine print or prepare for a massive decision like a move into a new town? Why did you even need to move? To avoid your debt collectors from your previous town, too? But, yes, Tom Nook does put you in debt. However, can I ask you when you need to pay this debt off? What’s that? You have infinite time to pay your debt that you got yourself into off? This debt that Tom Nook NEVER pressures you to pay? This debt that can be ignored for days, months, and years at a time? The debt that I honestly forgot about when I realized that I could accumulate all of it, then pay it off? The threat of his debt is never present, because there is never a deadline. There is no interest on it. Unlike student loans or a mortgage, you aren’t forced to make small payments towards your house cost. This means you can put your funds towards furniture, clothes, and gifts for your friends. You can focus on bettering your life before you are ready to make that commitment. #3 He Makes You Live in a Tent In New Leaf! Tom Nook puts you in a tent, because you weren’t expected to come. You’re lucky you were able to get any housing at all in your situation. While you selected a place to build your house, of course they need time to build it. These things don’t happen immediately, they happen overnight! The tent is temporary, and honestly, you can pay it off in a day. And guess what? In New Leaf, you aren’t even forced to pay a house upgrade unless you really want it! #4: His prices are extortion! It’s called an economy. Supply and Demand. Tom Nook meets the villagers supply for silly shirts and tools. If Tom Nook was never present, you would not have been able to acquire the tools necessary to grow your town or your home. Without Tom Nook and his catalogue, how could anyboy alter their house how they desire? The player, and the animal villagers that inhabit need Tom Nook as a location to sell their materials. 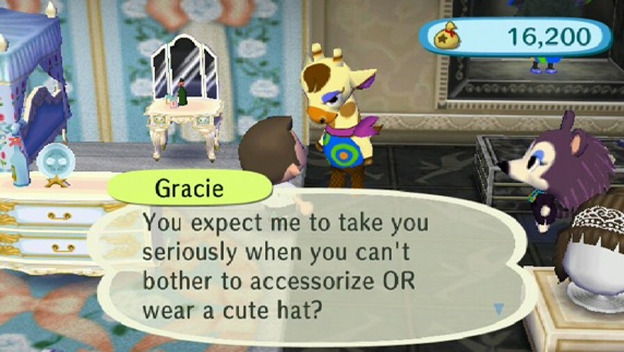 If you think Tom Nook charges you too much for furniture and other necessities, go to Gracie’s store. 100000+ bells for a shirt? Do something smarter and use it to put a down payment on a house. Tom Nook provides affordable prices for all, and does not discriminate on species.